To prepare for the baby coming and make the transition easier for Finn we decided to move him into our bigger spare bedroom and out of the nursery well before D-Day. I was so excited to have a new project to work on in the house and make this room really fun and feel like Finn. 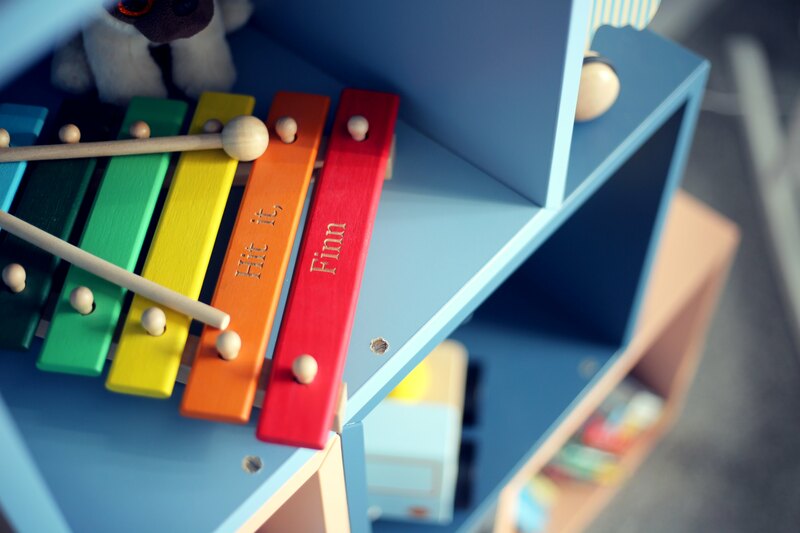 Decorating a nursery is kinda odd to me because you are (usually) doing it before the baby is in your life, before you learn their little personalities and what they like. How can you make the room feel special when you dont know the person who will be sleeping there? 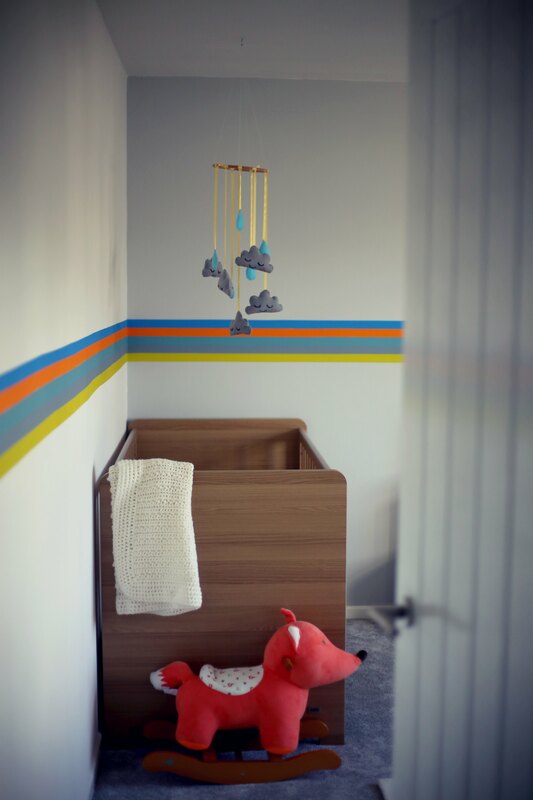 For this reason we havent changed the nursery much for baby 2, I think I will wait a year and redecorate it as well in fitting with the next little personality to join our house! Anyways, Im rambling!! On to Finn's Room. This room has been a misused space since we moved in 3 years ago, above is the room the week we moved in. We initially used it as a joint office space for Dave & I and then last year I turned into a spare bedroom on a budget knowing that we wanted more kids and it would hopefully become Finn's room. 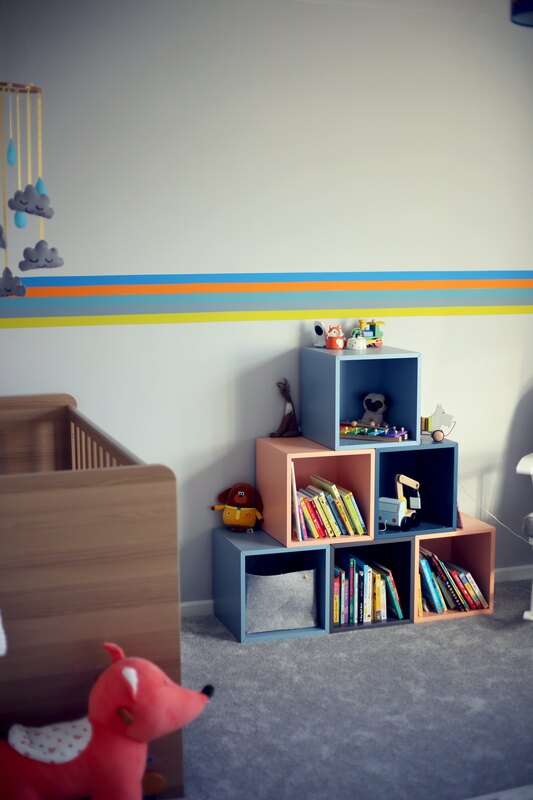 Literally two months after finishing it as a spare room (and painting it blush pink) I found out I was pregnant! 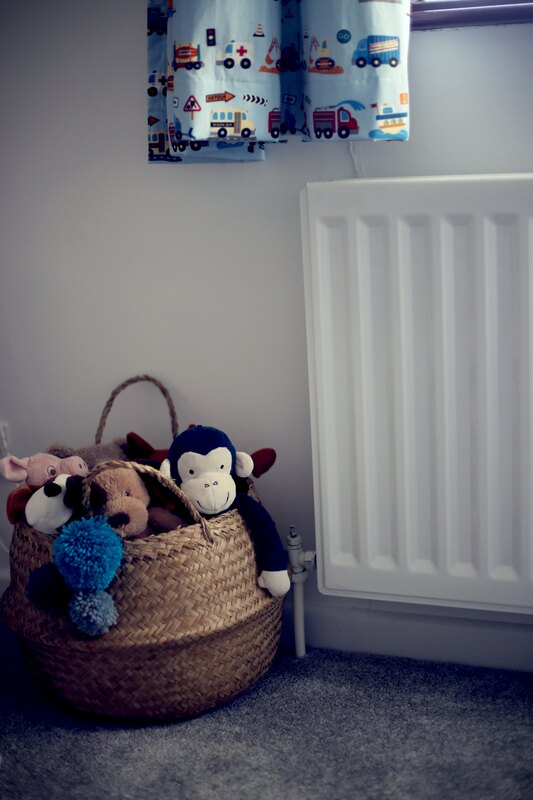 The first thing we did was replace the radiator, replace the carpet for new soft pile grey carpet and paint over my lovely blush pink walls. 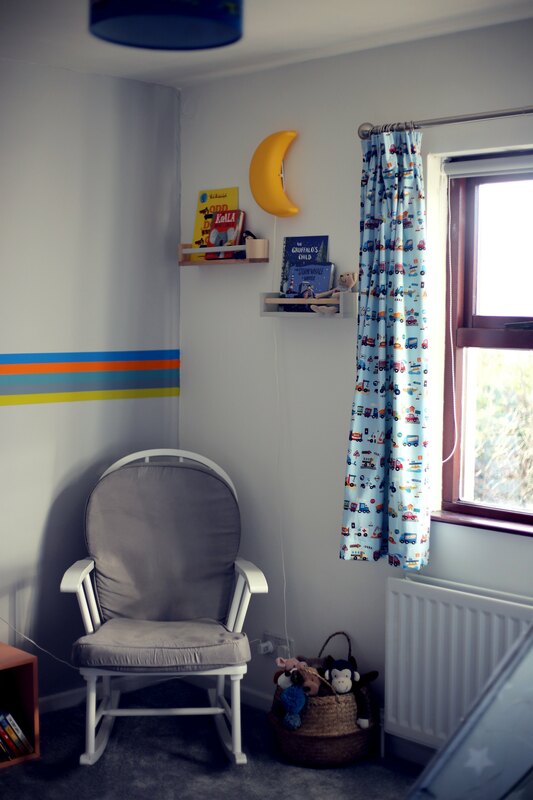 I had lots of different ideas for this room, I didnt want a whole theme room like Jungle theme or dinosaur theme but I knew I wanted incorporate cars into it some how because Finn LOVES them. I wanted something with lots of grey but a pop of colour, something fun for a 2 year old. I kept coming back to this idea of stripes like a border going across two walls in the room, in sort of an 1980's sports theme as id seen this alot on sweatshirts and jumpers over the summer. 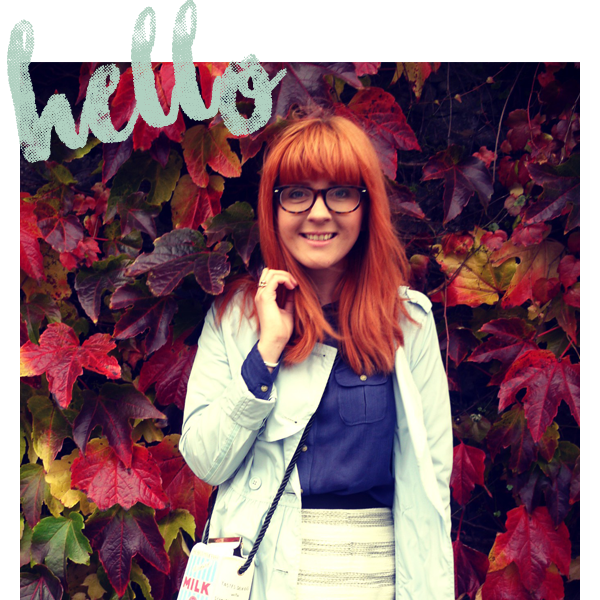 I picked colours based on a quilt my mum had made for Finn and set to work. We painted all the walls white with the back wall a soft grey. We pulled the car idea through with a navy lampshade adorned with cars, beautiful curtains my mum made and a cute road and car rug. 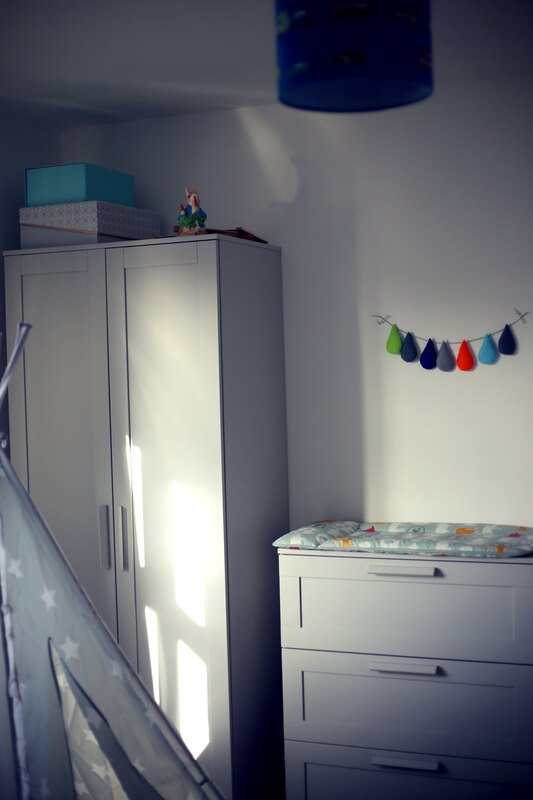 We got all new furniture for Finn from Next with a wardrobe, dresser & bedside table in a grey colour but to keep the space feeling familiar for him we have kept him in his cot for the minute and moved his mobile in that I made for him before he was born. I have also ordered this chair from Made that will go where the rocking chair currently sits and it will be moved back into the nursery for the baby. 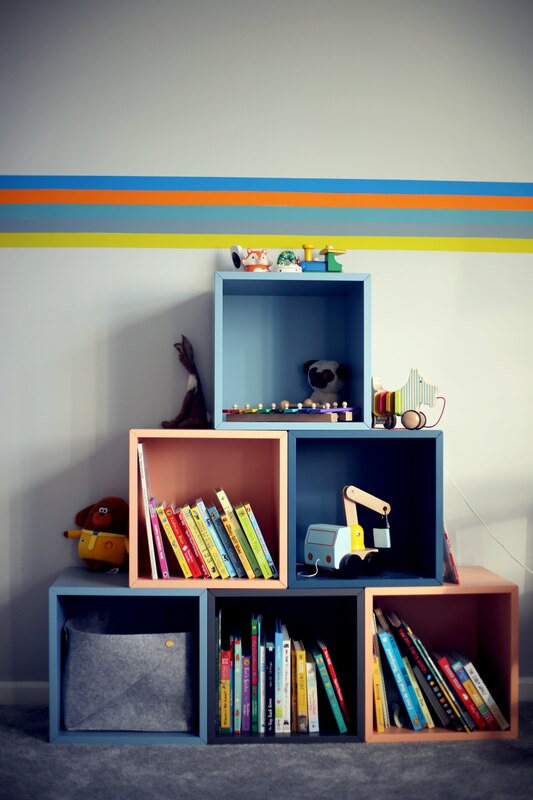 I wanted to make a feature storage solution along the back wall and kinda tie it in with the colours of the room, I looked at alot of different options but chose this customisable modular unit from Ikea to display toys and some of Finn's books. 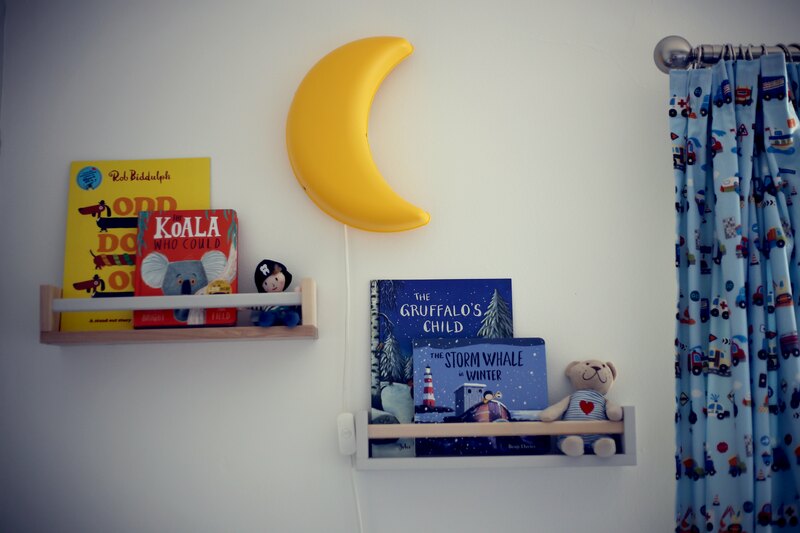 I also brought in his moon wall lamp from Ikea from his nursery and two Ikea wall shelves for books which I painted with pale grey wood paint leaving alternative sections the untreated wood. 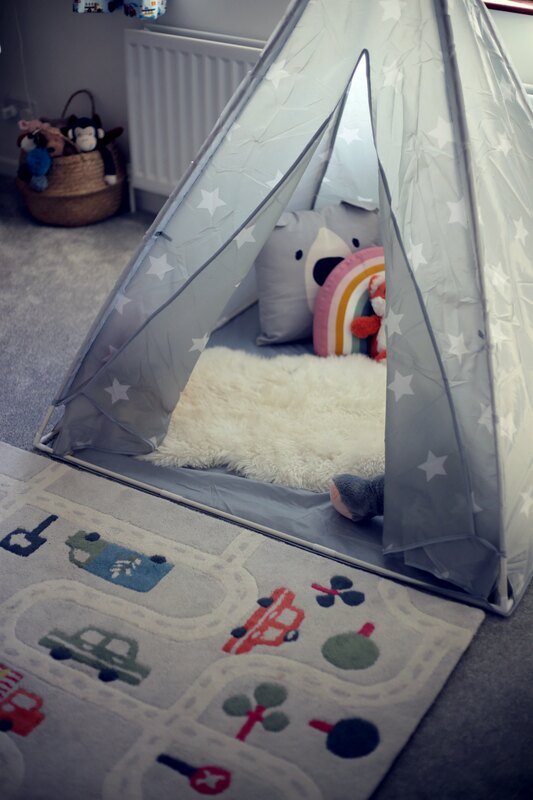 I always wanted a teepee in Finn's room so I was so excited when Vertbaudet gifted me with this one! I set up the inside with a sheepskin rug and lots of novelty cushions from H&M and Finn loves playing and chilling in it. 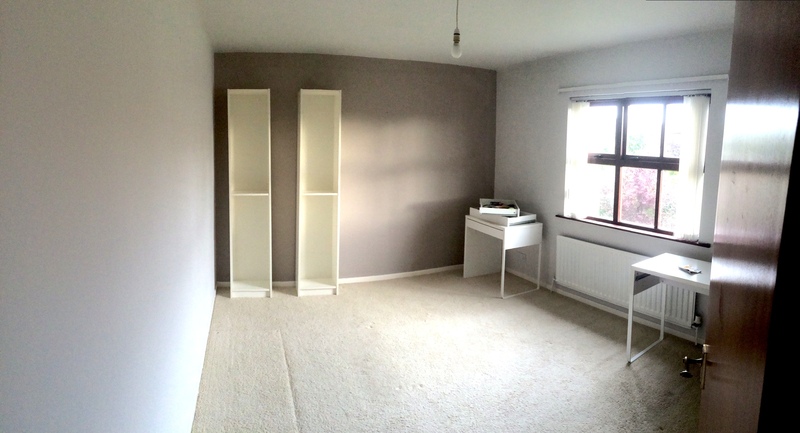 The grey colour works perfectly with his room. 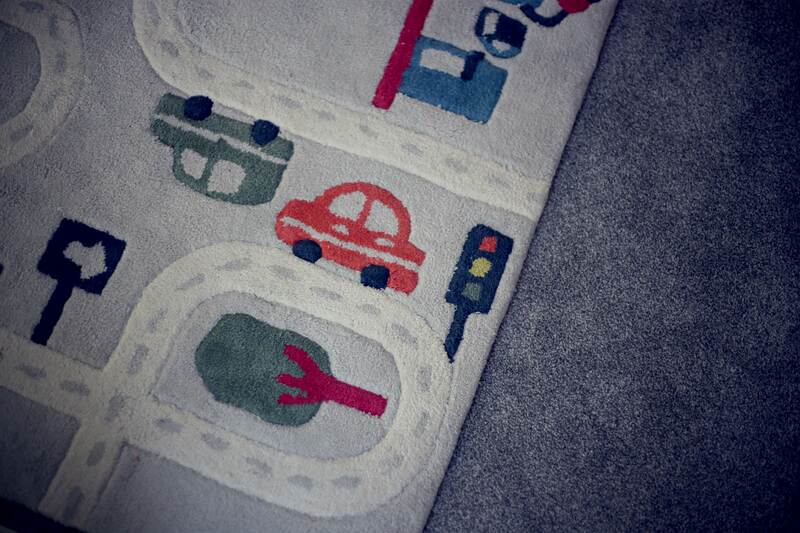 This awesome car rug was also gifted from Vertbaudet, I love that it pulls some all important cars into the room and also has hints of orange which ties in with the stripes. I didnt see the point in investing in another changing table as hopefully this year we will potty train Finn so we just use the changing mat on top of his drawers. The little felt rain drop on the wall I made inspired by the colours of the room and the stripes. I still hope to do a little gallery wall here as well but just havent gathered up all the prints and frames just yet. And there you have it, Finn's big boy bedroom! I love it and more importantly so does he and thats all that really matters. You have decorated the room nicely for the coming baby. 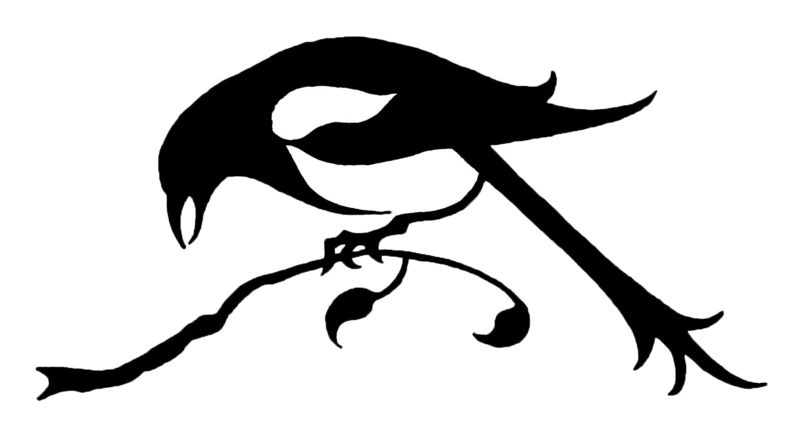 I appreciate your effort and work you have done.